"Unlock the full version of Blacklight: Tango Down and experience the bleeding edge of advanced warfare. Fight tomorrow’s conflicts with or against your friends in the gritty Blacklight universe. Make your stand across seven game modes with 12 different maps in intense online battles supporting up to 16 players. Or fight through four intense Black Ops missions co-operatively or alone; all the while gaining experience, collecting stats, and unlocking items. Earn new weapon attachments and items, improve your abilities, and engage your Hyper Reality Visor to locate enemies and take them out. Customize your character and weaponry from among millions of combinations to become the soldier you always wanted to be." "More Pirates! More Adventure! More Monkeys! 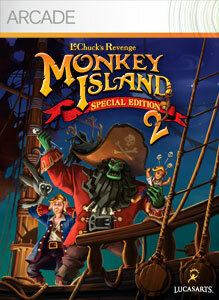 Relive the second hilarious swashbuckling misadventure of the wannabe pirate Guybrush Threepwood as he searches for the lost treasure of Big Whoop, attempts to win back the beautiful Elaine Marley and takes on the now evil zombie pirate, LeChuck! Monkey Island™ 2 Special Edition: LeChuck’s Revenge™ faithfully re-imagines the original classic in signature special edition detail. Plus, interact with the world of Monkey Island™ like never before with new direct-character controls, an interactive object highlight system, behind the scenes art viewer and creator commentary featuring the original developers of Monkey Island™ 2: LeChuck’s Revenge™!"